Have you been considering a health initiative for your workplace? If you have, you’re certainly not alone. According to The New York Times, a group of researchers have found that the modern workplace is a growing culprit in the obesity epidemic. In fact, a job that requires only light activity translates to an average decrease of 120 to 140 calories a day in physical activity. This new emphasis on declining workplace activity represents a real opportunity for employers to encourage their staff to make healthier choices in the office. With that in mind, we have found some easy ways for you to incite action among your team. 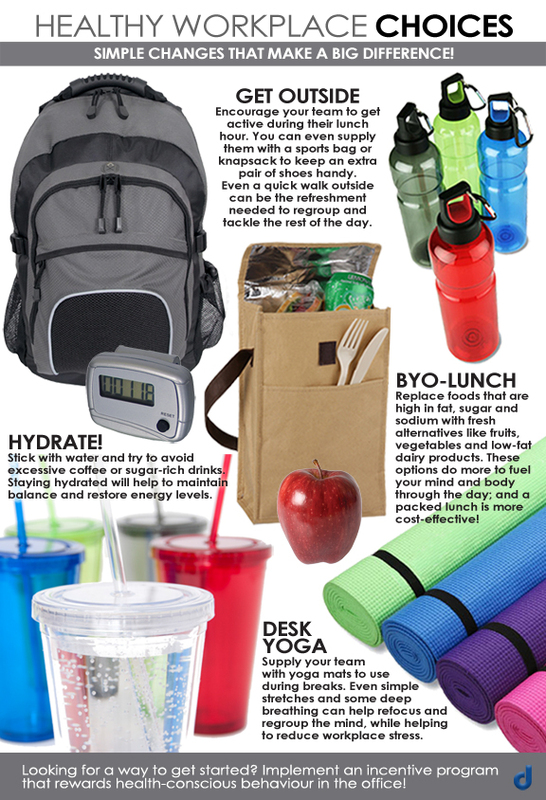 This entry was posted in Promo in the Office and tagged desk yoga, Drinkware, Health, Knapsack, motivational, pedometer, Reusable Lunch Bag, Reusable Water Bottle, sports bags, Work-Life Balance, Workplace, yoga mat by Debco. Bookmark the permalink.